It’s National Dog Day on August 26th! We’ve collaborated with canine experts to offer useful advice for caring for your dog over the summer. Nice weather is so often great when you’re a dog – more outdoor time with your favourite human, doggie paddling, tasty treats falling off al fresco tables and more. However, when a blazing Bank Holiday or a late Indian summer hits, the warmer temperatures can be uncomfortable, stressful and perilous if you are wearing a fur coat. 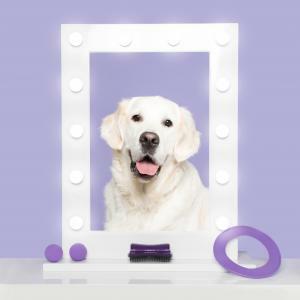 Calling on experts from leading pet lifestyle and dog-friendly holiday destination PetsPyjamas and their Veterinary friend Dr Marvin Frith, along with Pet Teezer’s grooming expert, Daniela Forshaw, we share their tips for ensuring your dog remains comfy, safe and well. Groom regularly (at least twice a week) to fur tip top and to spot any hidden problems brought on by the summer season such as grass seeds, ticks and fleas. Be sure to pay attention to paws too – checking in between their toes for ticks, grass etc. Keep ears tangle free and clean to prevent infection and expensive trips to the vets. Whether it’s dangling in their food or water, or from mouthing play with other dogs – ear fur can easily get tangled. Metal tools can scratch, pull and hurt whereas the Pet Teezer De-Tangling Brush is gentle for the sensitive ear area, both inside and out. Check the ear canal too and if yours’ is an avid swimmer pay extra attention, as those with fold over ears can be prone to infection. A squeezed out, damp cotton wool will help clean out gunk or remove excess moisture from their ears. Remember hot cars kill dogs so if you see any animal in a car on a warm day, call the RSPCA 24-hour national cruelty and advice line on 0300 1234 999.